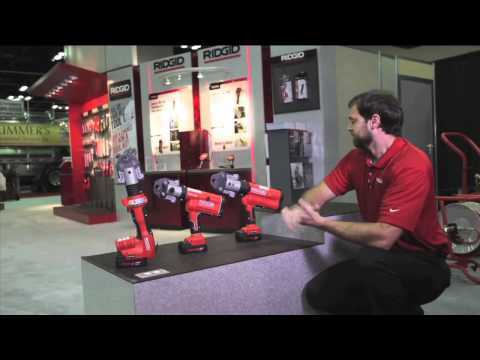 The RIDGID® Model RP 210-B Compact Press Tool is a fast and reliable way to join copper, stainless steel, PEX and multi-layer fittings. This light and compact tool works great for professionals to connect 1/2" to 11/4" (12 to 35 mm) tubing. The longest service interval available for compact press tools (32,000 cycles). Powerful 18V Advanced Lithium 2 batteries that maximizes presses per charge for more uptime. 270˚ swiveling barrel to access tight spaces. Head Rotation 270° barrel/jaw swivel. Battery 18V Advanced Lithium 2. Battery Charger 115V / 230V. Hydraulic Ram Output 5,400 lbs. (24kN). Operating Temperature Range +15° F to +140° F (-10° C - 60° C). Weight 5.9 lbs/2.6 kg (with Advanced Lithium 2 Battery). RP 210-B Press Tool is rated 4.9 out of 5 by 18. 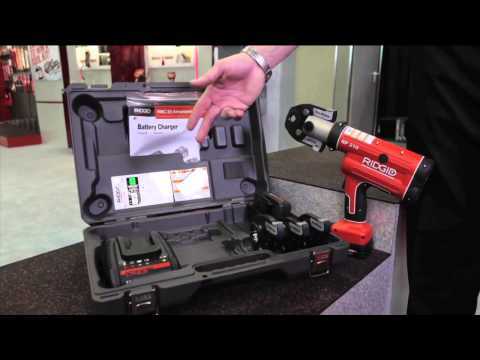 Rated 5 out of 5 by NHGasFitter from Another High Quality Ridgid Tool! If you're looking at this tool, then you already know what it is. So for my review I'll focus on a recent experience I had in the field. A customer called in for a no heat. When we arrived we looked the system over and quickly found it was going to be a tricky fix. This particular system was a steam boiler, and a return line had sprung a leak under the floor buried in dirt in the basement. Being the low point of the piping we knew water would slow our repair, not to mention the condition of the old buried, copper pipe. We decided to try out our new tool! A couple of fittings and section of pipe, within 10 minutes the heat was back up! It was awesome to see the press unaffected by water leaking out of the fittings, once the trigger on the RP-210b was squeezed the leaks were stopped! Customer was happy, and truth be told, we felt guilty it was so easy. Our customer is so pleased they want us back to remove the old steam system, and install a new hydronic system! Thanks Ridgid! Rated 4 out of 5 by Shon3550 from Very light and easy to use We have been using pro press for the past 8 years. We have just recently upgraded from our corded beast to this light cordless unit. You can get into tighter spaces with this and It's light and dependable. The battery last a long time. I can' t say much on durability yet since we are still within 6 months with this and no one has dropped it yet. Very pleased with its performance. Rated 5 out of 5 by Vinnivegas from Very reliable I started using propress in 2008. I have never had a leak or have I heard of anybody having leaks on their fittings. Definitely a time saver. Rated 5 out of 5 by sewerrat66 from cant be beat my #1 go to press tool.Love it so much i sold my other brand backup.Long battery life and great performance. Rated 5 out of 5 by dwilson from Great time saver Easy to use, this tool removes the worry of leaking copper repairs because of water or moisture left in the piping during soldering or brazing. This tool will replace soldering in the next 10 years. will this gun operate the mega press jaws? No, this will accept compact jaws only. The mega press jaws are standard size and go on the larger guns. What is the main difference between the 210 compact and the 200 compact? Thank you for contacting RIDGID. Both tools are able to press the same size fittings. The main difference between the two is the body style. The 210-B has a more 'traditional' style as seen in the photo, while the 200-B has an inline design which allows access into tighter spaces, enabling press connections in difficult to reach areas.